This is the place! 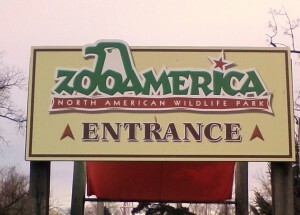 More than 200 hundred animals representing five regions of North America call ZooAmerica their home. Meander down tree-lined walkways to find familiar faces from the animal kingdom… and maybe discover some new ones. Located on 11 acres adjacent to Hersheypark, you’re sure to see a favorite and perhaps find a new favorite. Plan on an hour or so to walk through, more if you want to take a leisurely stroll. There are educational programs and special events available. Be sure to check out the Web site…it has a wealth of information. Admission ranges from free (if you are a ZooAmerica Member, have season passes to Hersheypark, are a Ranger Scratch Kids Club Member or a child age 2 or under), $9-11 for Junior, Senior or Regular. While the Zoo is open year round, with the exception of Thanksgiving Day, Christmas Day and New Year’s Day, it is advisable to check the website as hours do change throughout the year. Interesting to note: what began as a private animal collection is now an accredited zoo. Book now at 1825 Inn Bed and Breakfast right next to Hershey PA..consider us your nest away from home! This entry was posted in Zoo America by admin. Bookmark the permalink.